Lunarfurniture.com – Nowadays, we can see much news in the television or other media which show so many natural disasters destroy several areas in this country. As we know, Indonesia is a country which susceptible with natural disasters, and in this case, the people in this country have to deal with the disaster and aware of the prevention or even the action after the disaster so that we can minimize the psychology or even material loss. The early months of the year are the period that disaster attacks the nation; this is the peak period of rainy season, which can cause flood in many areas like big cities or even rural areas. This disaster can be dangerous for people since flood can drown people, as addition, flood can damage several electrical appliances and other things, even for wooden furniture. As we know, the wooden material won’t handle the flood water for long time. 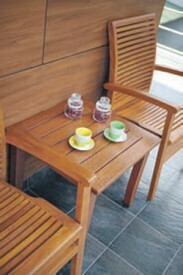 If it is drowned by the flood water, the wooden material furniture can be obsolete or even get rotten and rickety. How can we deal with this if the flood comes? First thing we must understand is that the wood can’t handle humid area, especially if the humidity is more than 60 percent. We must do prevention by moving the wooden furniture into save are from the flood water. If it is still drowned, we can do a cleaning after the flood by using humid sponge. Don’t flush it with water and dry it by dry cloth after being cleaned by sponge. Next thing we can do is by repainting the wooden furniture if the original paint is already faded. We also can add some varnish onto the furniture so that the wooden furniture can be covered well from the damage when the flood comes.